A previous Prime Minister reckoned that he aimed to make Australia the world’s biggest share-holding democracy. He succeeded in changing the political culture to have a greater focus on individualism, financial worth and competition. Unfortunately, when people pin their hopes for a just and fair society to a corporation, they can be sadly disappointed. A spate of deaths around the country suggests that many corporations have plenty of power to influence governments to produce policies and legislation convenient for their operations, but fail to take responsibility for their bad outcomes. The saddest aspect of these deaths – some in workplaces and some on the roads – is that they seem to have been very easily avoidable, and if this so, then management was negligent. Young men have died cleaning out apparatus or in scaffolding collapses. Women and children have died when heavy vehicles collided with them. Given that the Abbott Government has assiduously pursued Labor over the tragic deaths that occurred during installation of ceiling insulation, we have grounds to hope that it might take a stronger line in bringing corporate cowboys into line with decency. Although governments might like to cry ‘hands off’ where private business is concerned, they cannot evade responsibility entirely. During the Wran years in New South Wales, a strong member of the railways union complained about a deliberate but tacit policy of sending more freight onto the roads. He implied that he thought that some ministers were receiving inducements from trucking companies and fuel suppliers to support the policy. Either that or they were promised some future benefit. We can debate forever the social impact of having more heavy vehicles on the roads, but the old slogan applies - ‘privatise the profits’ while letting the community pay the costs. When the BP shareholders accept their dividends this year, some of them might spare a thought for the laws which enable the company’s profits to grow. A few might even wonder whether the company’s management policies, which are predicated on the maximisation of profit, meant that its trucks could be sent out without adequate maintenance, or their drivers despatched without proper training and rest periods. The loss of some 40 Australian lives in the MH17 air disaster was a tragedy that the federal government rightly addressed. It took firm action and spoken plainly to many people in positions of great power. Coalition policies on workplace relations and economic development make it questionable whether it will take effective action to challenge unscrupulous management in industries such as mining and building. As far as road deaths are concerned, it seems to think that spending more on major roads is the best way to increase safety. There are, however, serious problems with this approach. As one veteran state MP told me, he thought that addressing one difficult road simply shifts the bottleneck to another place. Another problem is that improving the road surface inevitably leads to demands for higher speed limits. When this happens, the safety gains made by the improved road are lost. When the road between Lithgow and Bathurst received a deal of work, the limit was lifted from 100 km/h to 110 km/h in a kind of macabre experiment. I say ‘macabre’ because the only evidence worth considering would involved fatalities. Ironically perhaps, the work had been promised to eliminate bends after the death of a local television newsreader when a truck’s load spilled onto her car. The government of the day probably felt additional responsibility because it had raised the height limits for such loads. It should not have escaped the notice of governments at every level that we so-called ‘baby-boomers’ are becoming a hefty bulge in the population pyramid. We have always been that but as we age, our needs change. Some small part of maintaining independence into maturity is the ability to be mobile. Of course that can mean walking but it also means travelling longer distances, and given the poor state of public transport in many areas, especially rural areas, a car remains important. Policies which depend on raising speed limits are not conducive to the safety of drivers with slower reaction times than the very young should have. It is in the interests of general safety to have roads which can be travelled safely at a lower speed, such as 80 kph.. Following the deaths incurred by a BP tanker in North East Victoria earlier this year, it was appropriate that the company’s fleet was grounded and inspected. It was right management gave public assurances that the driver would co-operate fully with inquiries. Perhaps he will be found to have been at fault. Truck drivers are almost always males, while victims are not, but that is another story. While drivers are easy and direct targets for public anger and potentially for imprisonment, perhaps it is time that corporate management began to take ultimate responsibility for polices that minimise maintenance and expect drivers to meet dangerous schedules. Subsidising heavy vehicles by building solid roads at public expense is one matter. Allowing the destruction of lives is quite another. Perhaps there should be clear and immediate penal provisions for any company executives or directors conducting their businesses in a manner dangerous to the public or their employees. Corporate cowboy image by Shutterstock. "The saddest aspect of these deaths – some in workplaces and some on the roads – is that they seem to have been very easily avoidable, and if this so, then management was negligent." What a naïve fellow you are Tony! Fancy thinking that the Abbott government's inquiry into the deaths which occurred during the installation of ceiling insulation when Kevin Rudd was prime minister has anything to do with 'bringing corporate cowboys into line with decency'. 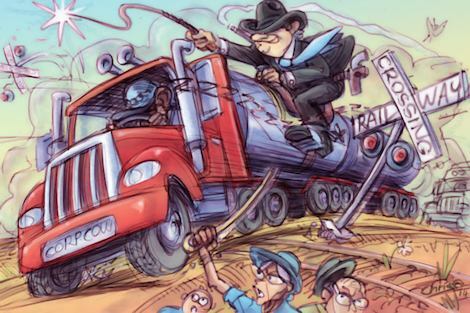 That aside, and on the subject of cowboys in the freight industry, it has been well understood for a long time that the road toll could be significantly reduced simply by lowering the speed limit. Up until the late 1980s the speed limit for heavy vehicles on NSW's highways was 80km per hour and there was no good reason why it was ever raised. The Grafton bus disaster in 1989 occurred shortly after the limit was lifted to 100km per hour resulting in a reduction to 90km, but under pressure from the freight industry the limit was again increased to 100. The industry at the same time also pushed for higher load limits, and in recent years has successfully lobbied for longer driving hours. That drivers of heavy vehicles are now permitted to work up to 14 hours in any 24 hour period borders on the criminal. Does anyone really believe that the economy would suffer one whit were the speed limit set at 80km for ALL vehicles on the open road, or that 8 should be the maximum driving hours for ALL drivers undertaking extended journeys? Come to the Northern Territory people and drive on our un-speed limited Stuart Highway for 250 kilometres between Alice Springs and Barrow Creek. Yes unlimited. Any speed you like in a car. The normal limit on all other part of the highway is 130 KPH except where signed when entering towns. This is a change implemented by the populist Giles CLP Government after extravagant promises to sectional interests at the last election. I believe most of the installers were self employed. Do we prosecute them? Or do prosecute those who contracted them without due responsibility? When some poor bloke gets glassed in a night club fight, it's the owner of the night club who faces the prospect of getting his license revoked. Who owns the roads? The government. So why shouldn't the government get the blame when the roads it owns are misused? If a private security company fails to prevent break-ins, its stocks fall and it loses clients. But when 9-11 saw a catastrophic failure of the US Federal government to guarantee security, its popularity soars. Time and again we fail to apply the same stringent standards to government "enterprise" that we apply to private enterprise. It's time to restore the level playing field, and expose government as the incompetent and dangerous nuisance it has become. Regarding: "Perhaps there should be clear and immediate penal provisions for any company executives or directors conducting their businesses in a manner dangerous to the public or their employees." The Work Health & Safety Act is very onerous and it does place criminal sanctions on management where found to be negligent so I don't think changing the law is going to help. The issue is the real or perceived belief that if an employee complains about a safety hazard, s/he will be sacked.